Gestation Period: 30 days Approximate Purchase Size: .50"-.75"
The Snowball Shrimp is the selectively bred white variant of the Neocaridina cf. zhangjiajiensis. Originally selectively bred in Germany for its white coloration, the Snowball Shrimp is just as hardy, and breeds almost as quickly as the Cherry Shrimp. The name "Snowball" came specifically from its pure white eggs, which look like snowballs! The snowball shrimp can be cared for in quite a large variety of different water parameters. The pH range is from 6.5 to 8.0, but people are known to even exceed these parameters and these shrimp still do well, also in both soft and hard water. Clean water is very important for these creatures while the temperature should also be a minimum of 72 degrees F.
Snowball Shrimp are omnivores and great for aquarium algae control. They share the same diet that most Dwarf Shrimp enjoy. Almost any kind of shrimp/fish food! Most Shrimp are algae eaters but will often times need supplemental feedings. Feeding for the snowball shrimp is recommended for a max of 1 time per day, and only an amount that these shrimp can finish within 2 hours. Overfeeding causes water quality issues, and ultimately death for these shrimp. It is OK to skip a few days of feeding these creatures. This gives them a chance to keep your tank nice and clean! The Snowball Shrimp can breed quickly! It takes about 30 - 45 days from pregnancy to hatching. You can see whether the female is close to hatching by the appearance of a set of eyes on the eggs, which are easy to see. Once you see this, hatching is about to happen within a few days! Snowball Shrimp are non-aggressive, and are quite active. 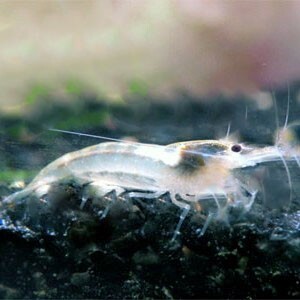 In an aquarium that has no predators, Snowball Shrimp will often be observed grazing on algae on aquarium plants, decorations, and on the substrate. When fed, the shrimp will often form large groups that are quite striking in appearance. The Snowball shrimp are some of the most beautiful shrimp species! As with all aquatic invertebrates it is important to make sure copper does not get into the aquarium. Copper is toxic to all Dwarf Shrimp. Many medications contain elevated levels of copper, so it is recommended not to medicate an aquarium with Dwarf Shrimp in it.